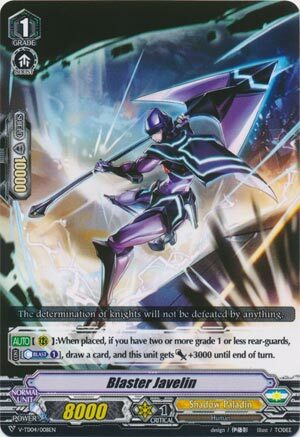 [AUTO](RC):When placed, if you have another grade 1 or less rear-guards, COST [Counter Blast (1)], draw a card, and this unit gets [Power]+3000 until end of turn. Staple at 4. Frankly no reason not to run given he gets you a free card and for the turn he scales with 13k attackers against Force Vanguards. Just about the only problem is the fact he’s vanilla afterwards, but the next wave of support should fix that. That, and the advantage is random, but the deck itself revolves around having a big hand and a poor field…once we get Phantom Blaster Dragon.